AMD has introduced its new Vision platforms at a launch event in Cannes today. AMD has promised full top-to-bottom 1080p HD support, promising "at least two thirds" of the video performance of rivals at the same price point. AMD seems to be hoping that by bundling descrete graphics into the Vision platform that it will be able to undercut Intel systems on price. 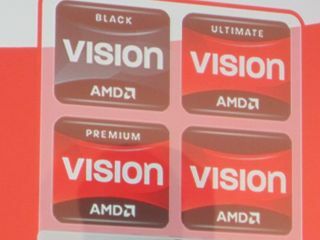 The Vision branding is now split four ways and will be used across all AMD-powered laptops and desktops. Four new platforms have been announced - Vision, Vision Premium, Vision Ultimate and Vision Black - the latter being for high-end gaming performance. "[This is] the biggest announcement of [AMD] platforms that will be made available at one point in time...this will have a multiplier effect for our business," said Alberto Bozzo, AMD's Vice President and General Manager for Europe. "Strong graphics is really at the core of this," added AMD's Chief Marketing Officer Nigel Dessau - pictured below. "People are using HDMI more and more to connect PCs to screens. Vision is a single thought, a typical good, better best. So we focused on high definition, we focused on delivering a rich internet experience." Dessau talked of making the experience of buying a PC simpler with Vision. "There are two types of users, the people who know about processors and then the processor unaware," he said. AMD estimates that just 25 million people worldwide fall into the first category, hence the company moving completely over to the simpler Vision branding. "We're changing how we think about things in a PC. We used to say let's get the biggest engine and drive it as fast as we can." "We have to think about how we merchandise them [PCs]. We need to make computers easier to use, we need to make them easier to buy." AMD's newest Turion processors - along with its more powerful Phenom sibling - is to be used in the laptops and desktops. Acer, HP, Lenovo and others have announced new kit featuring the tech. HP alone has 14 new AMD Vision products. "We took the speeds and feeds out and focused more on the users," said Jean-Pierre Calvez of HP. We're talking about what people actually do with the computers, we're talking about creativity."